The SAP Innomarathon Junior 2018 occurred in the weekend of June 9th and 10th. The event was organized by the SAP Labs Latin America CSR team and hosted by the SAP Next-Gen. It is a spin off event of the SAP Innomarathon, and it´s called Junior because it is targeted to high school students. The event was held in four different locations at the same time: Brazil, Chile, Mexico and Peru. In each location, high school students teamed up to compete in Hackathons. The main question that all the groups had to answer was: how can you tackle the UN Global Goals using SAP technology? In the first phase, all locations had to compete locally to find their SAP Innomarathon JR champion, where the appointed judges had to give points based on five different criteria: Engagement, Social Impact, UN Global Goals, SAP Technology and Project Viability. After the location champions were announced, they received feedback to improve their projects for the grand finale. The four location champions presented their ideas for the regional jury. Brazil with an intelligent biodigestor idea wanted to improve the use of a clean and sustainable energy. Chile presented a thermodesalination to mainly combat UN global goal numbers 6 (clean water and sanitation) and 7 (affordable and clean energy). Mexico team brought the recycling in the cities issue, and wanted to implement a system that would automatically separate trash to better redistribute for recycling purposes. Peru created a project for underground drip irrigation which is a better way to irrigate agriculture systems in arid zones. The SAP Innomarathon JR 2018 final happened with all the four locations connected remotely on the second day of the event. After the presentations from Labs Latin America CSR team, José Caceres, Director of Corporate Social Responsibility in Latin America and Maria Cecilia Calzada de Neumann, SAP Next-Gen Regional Manager for LAC, Spain and Portugal, evaluated and decided the winner. Since it was a tie between Brazil and Peru, the final prize was doubled and both teams got the award. 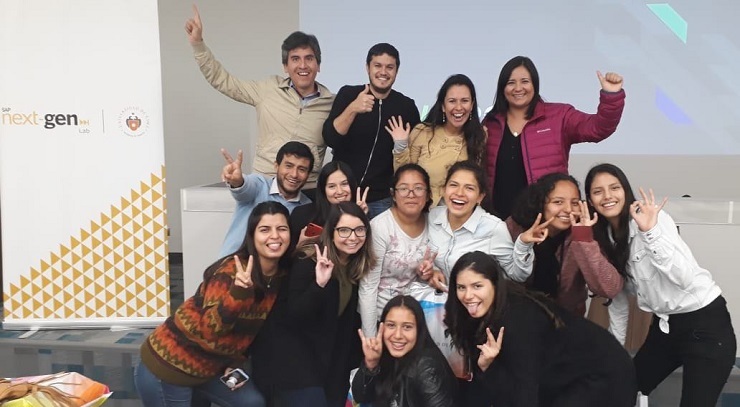 The students earned each 250 EUR and a 3D printer for their school (Instituto Federal do Rio Grande do Sul Campus Osório in Brazil and Nuestra Señora de La Reconciliación in Peru).